Are you turning Sweet 16 in the winter? If you are (or just wish you were), a Winter Wonderland Sweet 16 theme is the perfect theme for you. What is more beautiful than glittering snow, soft lighting, and shimmering snowflakes? Well, the birthday girl of course, but AFTER you, the setting for this theme is about as gorgeous as it gets. 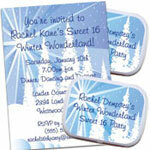 Let everyone know your party is not to be missed by sending a personalized Sweet 16 Winter Wonderland invitation. The blue and white motif and softly falling snow is the exact look you are going for. Include a little iridescent snow in the envelope for some winter sparkle. Or wow your friends with a custom caricature invitation. What could be more fun than the guest of honor (that's you!) 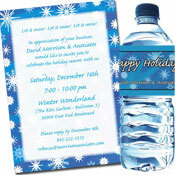 dressed as a snow princess (or maybe an Ice Queen...) on the front of the invitation? These fabulous invitations are works of art to be treasured long after the party is over. And the caricature can be used again for your sign in board, centerpieces, even thank you notes. You can always make your own invitation if you are feeling crafty. Cut out a paper snowflake and use a glue stick to attach it to a piece of light blue cardstock. 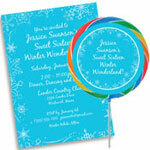 Add some glitter to the snowflake and write the invitation information on the back. No two will be alike! Your Sweet 16 Party - Make an Entrance! Line the walkway leading up to your Winter Wonderland with personalized luminaries. As your guests enter the party to wait for your entrance, have them leave you a message on your winter wonderland sign in board. Place it near the entrance with a few balloon bouquets around the board so your guests notice the board and leave you a birthday message. When you are ready to come in, have your DJ or a relative make the announcement. All eyes will be on you as you make your grand entrance; an oversized snowflake arch adorned with twinkle lights and snowflake columns accented with iridescent and silver sparkle power and light blue gossamer. Turn on a snowflake machine at the entrance so that as you walk in you are surrounded by shimmering snowflakes. Start with snowflake colored blue gossamer to create the perfect Winter Wonderland backdrop. Create a snowy scene by covering walls and ceilings with this lightweight and inexpensive material. Hang white twinkling lights behind the gossamer for soft lighting, since no Winter Wonderland is complete without lights - blinking, twinkling, dazzling lights. Hang even more strands of twinkling white lights on the walls, staircase railing or twisted together on the fireplace mantle. Fill the room with snowflake balloons tied in bouquets. Place them near the entrance, the sign-in board, and along the walls. We also love linking snowflake balloons for creating dramatic arches over the dancefloor, doorways or the buffet! Add in snowflake cutouts, snowflake cutouts and a sparkly garland, and everyone can enjoy the beauty, but not the cold, of winter. Why not have real snow? Your DJ or event venue can probably rent a portable indoors snow machine. Make sure that as your guests prepare to eat, your tables look as inviting as your food. Whether you choose to serve delicious appetizers and scrumptious desserts or a full meal of comfort food, your centerpieces and paper products should match the Winter Wonderland theme. Snowflakes are falling from the ceiling and landing on your tables, only now they look like paper plates and napkins. Cover your tables with pale blue and silver paper goods and all that will melt away are the hours of fun your guests are having. White rose centerpieces surrounded by votive candles will make the tables breathtaking. Add snowflake balloon bouquets to the table if you have a large room and need to add height to the tables. As a final touch, sprinkle snowflake confetti around the candles and flowers. A common activity at a Sweet 16 party is the candle lighting ceremony. Checkout out the Sweet 16 Candle Lighting Ceremony Guide if you need instructions. Make sure your candle lighting matches the rest of the Winter Wonderland theme by winter themed candles or candleholders. Don't forget to check out our complete list of Sweet 16 Party Games! The perfect party favor for your Sweet 16 Winter Wonderland is a personalized candy bar. Whether it’s milk chocolate or dark chocolate, this candy bar is a delicious way to say "Thanks for coming to my Sweet 16". Set one at every place setting, or have them by the door for guests to grab on the way out. You can even set out small single serving sized bottles of milk or bottled water to go with the chocolate (how thoughtful you are!) and even they can have personalized bottle labels to match the chocolate. Now that is coordination! Tie a tag on the bag that says "Thanks for coming to frolic and play in my Winter Wonderland!". Your Sweet 16 party will be so much fun people will still be talking about it in the summer! Have fun at your Sweet 16 Winter Wonderland!